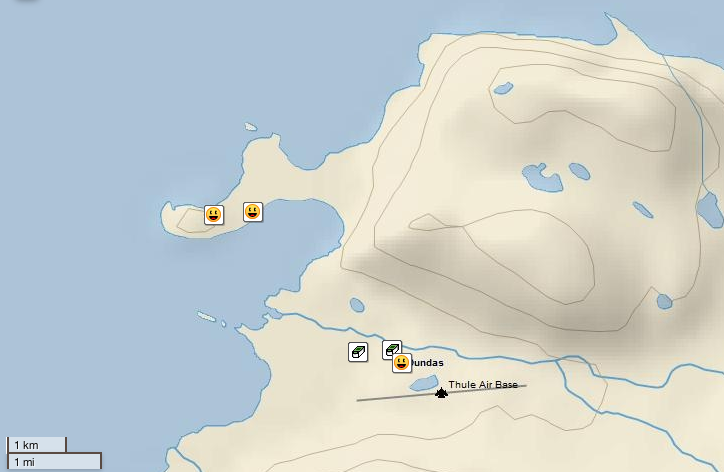 This entry was posted in Greenland and tagged geocaching, Greenland, hiking, Thule, travel. Bookmark the permalink. By pure chance, recently, I purchased an old book, (I must add, in poor condition, but still fully readable, I collect old books for a hobby), titled: Lost in the Arctic by Capt. Ejnar Mikkelsen 1913, being the story of the “Alabama” expedition, 1909 – 1912, and was entranced by his story of how he and Iver P. Iversen sledged from Shannon Island to Independence Fjord and back again; particularly that the return journey was made along what is the East coast of Greenland. While I do understand that your research interest is on the other side of Greenland; I ask, is there a much more recent publication available that will allow me to compare the ecology of that Eastern coastline, so well described by Mikkelsen just over a century ago; with what is there to see today? Again, having read that book; and with the greatest of respects; the current expeditions have no comparison with the dreadful hardships endured by Mikkelsen and Iversen. If anyone reading my post herein has not yet, I recommend they do read it, it is an even better description of such hardships than that described within the likes of South with Scott by Mountevens. Chris: I could not agree more. We also share the love of old books and early expedition reports, but I have not yet penetrated as far back in time as you have. My latest is Lauge Koch’s 1928 “Contributions to the Glaciology of North Greenland” just before explorations by air craft started. There is not much I can say about the ecology of Greenland’s coastlines that I rarely see from up close. An excellent book that you may like is by Peter Schmidt Mikkelsen who describes histories and locations of trapping and explorations of eastern Greenland. Links to book, person, and projects are found at http://www.xsirius.dk/en/node/191 that you may enjoy.